From an attendee point of view, I was able to see the latest and greatest models and innovative technology that is going to be upcoming into the market. I also look forward to meeting the many manufacturers and reps face to face. DSE has a broad gamut of digital signage application enclosures and mechanisms to support the displays along with amazing software that run on the displays to provide all sorts of additional viewer data. One software was programmed to be able to detect someone’s gender and approximate age so that it would know what information to bring up on the screen that would most appropriate for that customer. The same system also kept track of who walked past the display and stopped for a second to take a look at it so that it could keep record and produce reports of the accumulated data. There were also LED posters that now have the ability to be run off of CAT6 or run wirelessly. Placing these posters side-by-side can create a larger, much more impressive picture. Some of the manufacturers that were very impressive were Playnar, QS Tech, and CreateLED. CreateLED was showing a 1.4mm display that was 1344 pixels by 2352 pixels that was just spectacular. CreateLED was showing their new AirMAG-S frame, populated with their 1.4mm modules and the colorimetry was outstanding – as usual. They also had a new AirIM Intelligent Display Unit system on display. All panels were driven with their new ChromaLED Master Pro HD all-in-one LED Controller and Video Processor. Very impressive booth. 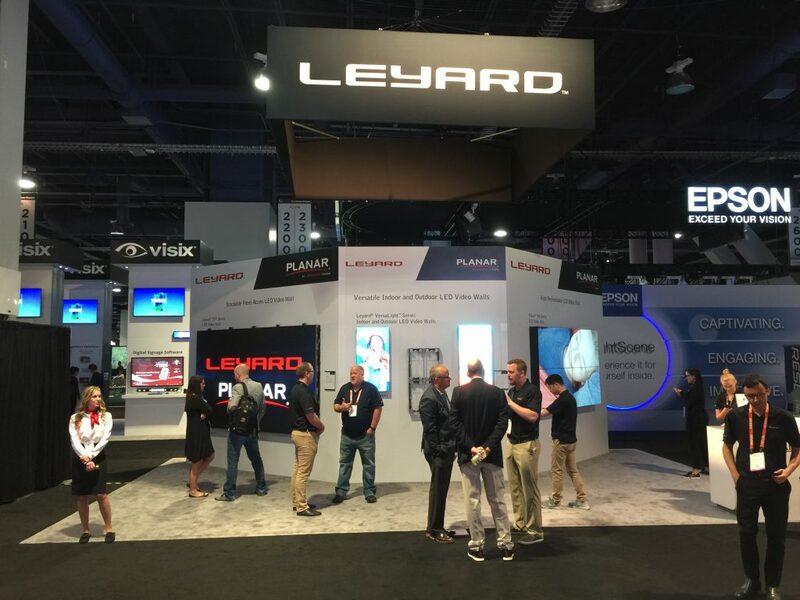 The Planar VersaLight product, as well as their TVF series were well engineered for direct-to-wall ADA compliant high-res displays. I was particularly taken by E Ink presentations, the electronic paperless technology that makes the Kindle/Nook/iBook work. It will be a significant player in the future of signage and displays. Premier Mounts showed a huge retractable wall system for those panels that are not completely front serviceable, and many well-engineered display support products and hardware. Overall, shows are always a lot of work when done right, whether you are exhibiting or simply attending for education or acquiring new technology. DSE was just a two day show which must be very challenging for manufacturers to set up and tear down so quickly. After checking out the scores of hardware companies, there were more software and application vendors than you could see in two days.